The two-day, Memorial Day weekend show to return to a 12 Noon start time; fans are encouraged to arrive early for best seats & parking. Wantagh, NY - April 13, 2017 - Bethpage Federal Credit Union, New York State’s largest credit union, and the New York State Office of Parks, Recreation and Historic Preservation announce details for the 14th Annual Bethpage Air Show at Jones Beach in Wantagh, NY. Taking place on Memorial Day Weekend, Saturday, May 27, 2017 and Sunday, May 28, 2017, the show will return to a 12 Noon start time and conclude at 5 PM. Show organizers are encouraging fans to arrive early for best seats and parking. 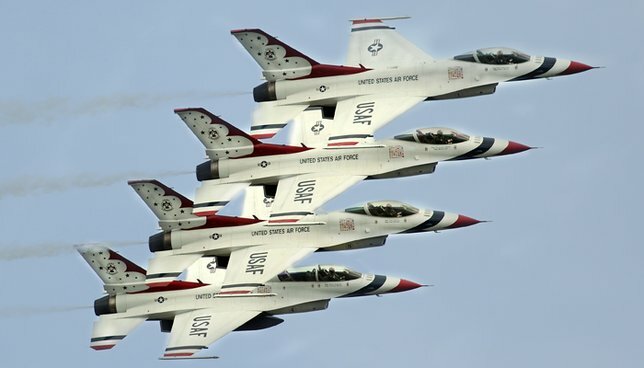 The air show will feature “America’s Ambassadors in Blue,” the U.S. Air Force Thunderbirds, who will be demonstrating the extraordinary capabilities of the pilots flying the F-16 Fighting Falcon, an $18 million, 19,700-pound fighter aircraft, also known as the Viper that can travel at speeds up to 1,500 mph. performed for over 280 million people in all 50 states, and 57 foreign countries. This will be the legendary team’s fifth Bethpage Air Show performance. The show will also include the return of Hometown Hero Major Kevin Walsh, Thunderbird Pilot #7, who hails from Levittown, New York and attended St. Anthony’s High School in South Huntington. Major Walsh is the Director of Operations for the U.S. Air Force Air Demonstration Squadron. Major Walsh’s family currently resides on Long Island. Other star-studded performers at this year’s Bethpage Air Show include the United States Army Golden Knights Parachute Team, performing in their 13th Bethpage Air Show; legendary air show pilot Sean Tucker performing in his custom-built Oracle Challenger II biplane; extraordinary aerobatic pilot Matt Chapman; Lt. Col. John Klatt flying the Jack Links’ Screamin’ Sasquatch Jet Waco; the world famous GEICO Skytypers and their flight squadron of six vintage WWII aircraft; the American Airpower Museum Warbirds; Long Island’s own David Windmiller; and for their 2nd Bethpage Air Show performance, the SUNY Farmingdale State College Flying Rams who will fly seven of their 22 college-owned aircraft in a fly-by piloted by their top academic professional pilot performers. Also underscoring Long Island’s finest will be a show tribute by the U.S. Air Force Thunderbirds to Fallen Warrior Sgt. Anthony L. Mangano of Long Island, who was killed in action in 2006 while deployed in Afghanistan. As part of the honor, the Thunderbirds will place Sgt. Mangano’s name on Thunderbird Jet No. 1 during the show for a tribute performance. Sgt. Mangano’s family members will also be attending the show as guests of the Thunderbirds. The Bethpage Air Show had record breaking attendance last year when 453,000 people attended the show for its biggest lineup ever. In 2015, over 439,000 spectators chose the Bethpage Air Show as their Memorial Day holiday weekend destination when the Thunderbirds last visited. WABC-TV Channel 7, PSEG Long Island, Natural Heritage Trust, Connoisseur Media Long Island, and the New York Islanders. The show can be heard in its entirety on WHLI 1100 and 1370 AM. Bethpage Air Show announcers will lead air show activities from the Jones Beach State Park Central Mall Boardwalk area where food, beverages and ground activities will be available for fans. The Bethpage Air Show is free to the public, but the standard $10.00 vehicle use fee will be collected each day upon entry to the State Park. For the 2017 NYS Empire Passport holders, there is no vehicle use fee charge. For $65, the Empire Passport permits unlimited vehicle access to most facilities operated by the New York State Office of Parks, Recreation and Historic Preservation and the New York State Department of Environmental Conservation. Empire Passports are available for purchase at any Long Island State Park and can be utilized immediately and are effective until March 31, 2017 to enjoy the forests, the seashores and the lakefronts of New York State’s parks through all of New York’s beautiful seasons. For up-to-date information about this year’s show, please visit www.bethpageairshow.com or https://www.facebook.com/BethpageAirShow/, or contact the New York State Office of Parks, Recreation and Historic Preservation, Regional Office, Recreation Department at 631/321-3510. Bethpage Federal Credit Union is a premier community financial institution committed to enriching the lives of its members, employees and the communities it serves for the past 75 years. Bethpage is the largest credit union in the Northeast Region, as well as 16th in the nation. Bethpage is a federally chartered credit union open to everyone that opens a $5 minimum share account. As a financial cooperative, Bethpage offers the best-in market rates, low fees and world-class service, and a full menu of personal and commercial financial services. On Long Island, Bethpage maintains branch locations in Albertson, Baldwin, Bay Shore, Bay Shore King Kullen, Bethpage, Centereach, Central Islip, Commack King Kullen, East Meadow NuHealth Medical Center, East Northport, Elmont, Farmingdale, Freeport, Glen Cove, Hempstead, Huntington, Levittown King Kullen, LIU Post (Brookville), Long Beach, Lynbrook, Massapequa, Melville, Mineola, North Babylon, Patchogue, Port Jefferson, Riverhead, Roosevelt, Seaford, Smithtown, Valley Stream King Kullen, West Babylon and Westbury. In New York City, Bethpage maintains a branch location at 111 W 26th Street. Bethpage also offers over 500 surcharge-free ATMs in King Kullen, CVS Pharmacy and Costco locations. For more information on Bethpage’s robust portfolio of banking, borrowing, and investment services, visit www.bethpagefcu.com or call 1-800-628-7070. Subject: LongIsland.com - Your Name sent you Article details of "Long Island’s Greatest Show: The 14th Annual Bethpage Air Show At Jones Beach To Showcase Long Island’s Finest"